Korean actors Kim Soo-hyun and Jun Ji-hyun have been cast in an upcoming drama. Kim and Jun will pair up in new SBS fantasy drama, tentatively titled “The Man from the Stars,” set to premiere in December, an official with SBS told TenAsia over the phone on Friday. The drama will center on a top celebrity (Jun) and a man (Kim) from outer space who have lived on Earth since four hundred years ago in the Joseon Dynasty. The ′thieves′ Jun Ji Hyun and Kim Soo Hyun will be reuniting on the small screen. On August 16, HB Entertainment, a drama production company, confirmed that Kim Soo Hyun and Jun Ji Hyun will be costarring in an SBS drama special. Kim Soo Hyun will appear as Do Min Jun, an alien who landed in Joseon 400 years ago and still lives in Korea to this day, while Jun Ji Hyun will be Korea′s top actress Chun Song Ee. "We tried to cast the best actors that would fit the characters," a rep from the production company said. "We′ll try hard to deliver a heart-warming and bright drama to live up to expectations." The drama will be Jun Ji Hyun′s first in 14 years since the 1999 SBS drama Happy Together. The SBS drama special has no title yet, but will be produced by Jang Tae Yoo of A Tree With Deep Rootswith a script written by Park Ji Eun of Unexpected You. It will air sometime in December. We combed through six, different entertainment sources, and each one is confirming the re-teaming of Jeon Ji Hyun and Kim Soo Hyun in SBS’s December drama Man From Another Star. Do Min-Joon is an alien who landed on Earth 400 years ago during the Joseon Dynasty period. Do Min-Joon possesses a near perfect appearance and enhanced physical abilities involving his vision, hearing and speed. Do Min-Joon holds a cynical view to human beings, but he falls in love with actress Cheon Song-Yi. The actors heated up the big screen when they previously starred together in The Thieves. It was the first time that Ji Hyun did a kissing scene, and it’s likely she’ll get more comfortable resting her lips on Soo Hyun’s puffy ones in Man From Another Star. Ji Hyun’s last drama was 1999′s Happy Together, and since then, she has only acted in films and CFs. So, this new show is something to look forward to and might become a ratings dream for SBS. “The Man from the Stars” will be a romantic-c0medy about a top actress named Chun Song Yi and an alien who came to earth 400 years ago taking on the name Do Min Joon. It is written by Park Ji Eun (“You Who Rolled in Unexpectedly“) and directed by Jang Tae Yoo (“Tree with Deep Roots“). “The Man from the Stars” is expected to air in December. Another confirmation posted in Soo Hyun's Agency. Keyeast posted this in their Official facebook page. I'm so excited about this drama! I really love their chemistry in The Thieves esp JJH,she's really funny there.. :DDecember! please come faster!! On August 16, HB Entertainment Production confirmed that Kim Soo Hyun and Jeon Ji Hyun will reunite in the upcoming SBS drama, “Man From The Stars”. Both actors appeared in 2012 top-grossing film “The Thieves”. Kim Soo Hyun will play the role of Do Min Jun, an alien who lived in Joseon era, 400 years ago up to modern times in Korea. Jeon Ji Hyun will play the role of Korea’s top-actress, Chun Sung Yi. This will be Jeon Ji Hyun’s comeback in the small screen. Her last drama was 1999 “Happy Together” and has been focusing on movie projects since then. Kim Soo Hyun’s last project was a huge-success movie, “Secretly, Greatly”. Man From The Stars will be produced by Jang Tae Yoo (Tree With Deep Roots) and will be written by Park Ji Eun (You Who Rolled In Unexpectedly). It will air sometime in December, 2013. Confirmations are in: Kim Soo-hyun and Jeon Ji-hyun are getting back together for the alien time-traveling fusion Joseon-to-modern-era romantic comedy (could there BE more descriptors for a drama?) Man From Another Star. Woot. Bring on the wacky zany fun. Let’s just throw the kitchen sink at this sucker and add superpowers, fugitives, and ghosts, and then we’ll have covered all the recurring tropes of the last two drama years. The new SBS rom-com is gearing up for a winter premiere, for what will likely be a programming slam dunk for their Wednesday/Thursday lineup all the way from I Hear Your Voice to the currently reigning Master’s Sun, with Heirs and then Man From Another Star to follow. Someone’s bathing in money over at SBS this year. The drama comes from the writer of the hit weekend drama You Who Rolled In Unexpectedly, and the PD of acclaimed sageuk Tree With Deep Roots. I think we’re in for something good. In the present day he meets Jeon Ji-hyun’s character, a top actress. So… she’s playing herself. The drama will be about the man and woman who are literally from two different planets, overcoming their intergalactic differences to make a romance work. The tone is described as cheery and heartwarming. I’m gonna go out on a limb and say, DUH. The Thieves co-stars made a big splash with their onscreen chemistry that was justenough of a tease to keep us wanting more, so I think they’ll make a great pair in a drama. Jeon Ji-hyun hasn’t been on television since 1999′s Happy Together, and Kim Soo-hyun’s last drama The Moon That Embraces the Sun is still the biggest weekday ratings hit since its day. Now that both actors are officially starring, I’m officially excited. [by Cho Suyoun] Top stars Gianna Jun and Kim Soo hyun will be starred together in a new drama. The duo of Gianna Jun and Kim Soo hyun from the hit film ‘Thieves’ will work together again on TV screen. The series in which they both will appear is about a top actress and a mysterious man from the space who has been lived for 400 years. Since Gianna Jun made two hit films in last year and it has been 14 years since her last appearance on TV screen, she is attracting attention of all the audience that have been waiting for her to act on TV screen. Moreover, as another main cast Kim Soo hyun also had two mega hits in the series ‘The Moon that embraces the Sun’ and the film ‘Covertness,’ people expect the combination of two will create another big success. I am not into aliens! But I love Kim Soo Hyun, I will definitelly check it out! really really excited for this, Jeon Ji Hyun & Soohyun has a really good chemistry in 'The Thieves', and the fact that i really love them both ensures this drama on my watch list..
Jun Ji Hyun has confirmed her return to the small screen after a 14 year hiatus with upcoming SBS TV drama, ‘The Man from the Stars’ (screen writer: Park Ji Eun, director: Jang Tae Yoo). Jun’s agency said earlier on July 10th, “Jun Ji Hyun has received an offer to appear in ‘The Man from the Stars’,” which then led to reports that she had already agreed. The two parties are now discussing over the details, and if everything goes to plan, this will be Jun Ji Hyun’s return to the small screen after 14 years following her 1999 drama ‘Happy Together’. ‘The Man from the Stars’ is scheduled for broadcast this December, and will see a dream pairing of screen writer, Park Ji Eun (My Husband’s Got A Family), and director Jang Tae Yoo (The Tree of Deep Roots). With the confirmed addition of Jun Ji Hyun, viewers will now be piqued to see who else will be filling the rest of the cast list. The drama talks of an alien who came from Joseon Dynasty into the modern world, and his relationship with a top actress who thinks highly of herself. 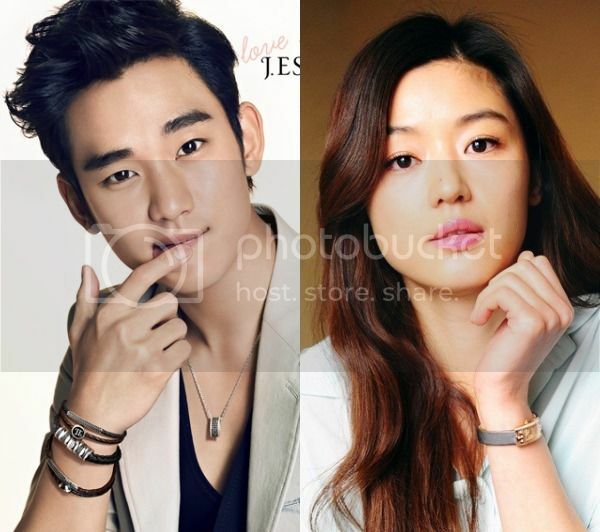 Jun Ji Hyun is cast as the top actress named Chun Sung Yi, while Kim Soo Hyun will play the alien man named Do Min Jun. The actress Jeon Ji-Hyun makes appearance on the drama in 14 years since SBS 'Happy Together'. The producing company HB Entertainment stated "Jeon Ji-Hyun confirmed to make appearance with Kim Su-Hyun on SBS 'A man from star'. In 'A man from star', Jeon Ji-Hyun and Kim Su-Hyun each played role of national top actress Chun Song-Yi and the mysterious man Do Min-Joon, who has been living until now since he had come to Cho-Sun 400 years ago. The producing company said "we focused on casting the best actors who would match well with the character. As much as it is getting lots of attention from people, it will be made into drama that would give warm, cheerful pleasure to the viewers." By this, Jeon Ji-Hyun returned to the drama in 14 years since the last 1999 SBS drama 'Happy Together', and those two are performing together once again since the movie 'Thieves', getting the expectation higher. Meanwhile, SBS 'A man from a star', written by 'Nungcool' Park Ji-Eun writer, and directed by 'Deep rooted tree' Jang Tae-Yoo producer, will be broadcast on coming December.